We've been noticing a trend lately. No matter where our customers live - Zionsville, Avon, Carmel, Fishers, Noblesville, Indianapolis - they are starting to express more concern for the environment. We are happy to point out that there are many flooring choices that are beautiful addition to your home while being friendly to both the environment and your budget. We offer Karastan's SmartStrand line of carpets. Karastan, one of the world's leading carpet manufacturers, created SmartStrand with permanant, built-in stain protection, cleans with water and mild detergents, durable and environmentally sound. Karastan believes we all have a part in making the right choices for our environment. That's why they created a carpet made in part from crops. 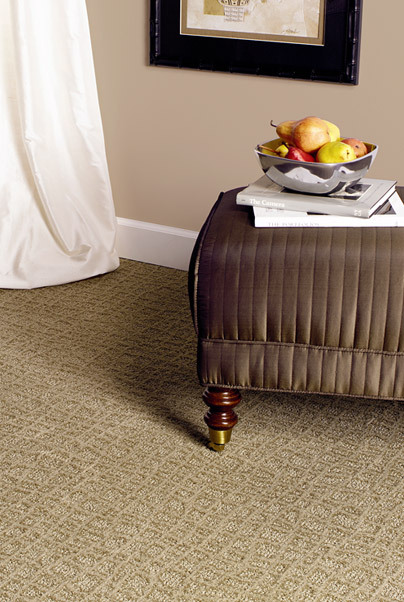 Smarter resources, smarter processes, smarter carpet... Smartstrand®. Learn more about carpet options. Cork represents a special kind of wood flooring because it comes from a harvested resource (only the bark is harvested from the tree). Cork floors are made from the waste cork that makes wine stoppers. Cork is appealing to many homes today because it is a renewable resource; a recycled product and with water-based finishes and adhesives creates a long lasting, comfortable floor. Learn more about wood options. A relative newcomer to the natural flooring market, bamboo is a grass that regenerates faster than wood making it an excellent green-friendly product. The hardness varies a bit more than wood but offers a similar look and feel. Learn more about wood options. Often made from post-consumer (what you recycle from household use) or post-industrial (what manufacturers recycle) glass, glass tiles are becoming extremely popular because they are eco-friendly and use a substance that used to end up in landfills. Since glass comes in a multitude of colors, recycled glass tile is available in a wide spectrum of shades and can be designed into all types of patterns. Learn more about tile options. These are just a few examples of the floor options that you'll find at Kermans Flooring in Indianapolis. We invite you to stop by our Castleton-area showroom and discover how you can be an environmentally conscious consumer as you select new flooring for your home.